* The latest firmwares for Voice, Voice+, Voice Lite, VT3, VS4, and Voice2 has been released at 10th July, 2017 and this issue can be solved by updating the latest firmware. 1. Prepare Window XP or Windows 7 PC, or Mac. 2. Connect your Voice, Voice+, VT3, VS4, or Voice2 with your PC or MAC. 3. Run GBManager or G3Mac and execute “Update Firmware”. 4. After update, connect your device with Windows 10 PC and Run GBManager so as to check whether your device can be detected in your PC. • From the main menu screen, use toggle buttons ③ and ④ to get to the Settings icon and then press button ① to enter Settings. • You can change or view the settings of Display, Clock, Units, Language, and About. • On Settings menu, press button ① to confirm your selection, and Press button ② to cancel it and return to the previous screen. ⑴ Color Theme : Sets the color for the screen. Sets the date, time, time format(12/24hour), and DST. Selects the language among English, French, Spanish, Korean, Japanese, Chinese. • Select "HAZERDS" by using the toggle buttons ③ and ④. Press button ① to view Hazards information. Or, you can enter the "HAZARDS" by pressing and holding button ④ for 3 seconds from Golf Mode. • When more than 3 hazards are available, use toggle buttons ③ and ④ to view the next hazards. 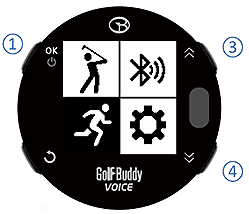 • From Golf Mode, press button ① to show the full menu, then with toggle buttons ③ and ④ go to the “Shot Distance” and select by pressing button ①. • Press and hold button ④ to reset the distance. 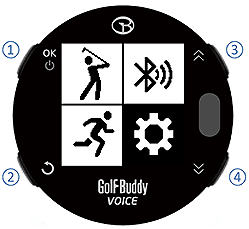 • From Shot Distance Mode, the VOICEX will return to the main screen by pressing any button. • Press and hold button ④ to selecting between Left, Right, and Dual Green shown below. 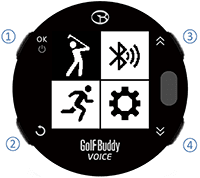 • In Golf Mode, when you press button ⑤, the VoiceX will verbally tell you distance to the center of the green. 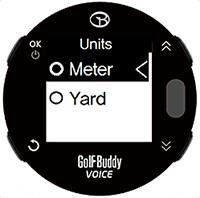 • Press and hold button ⑤ and the VoiceX will tell you distance to the front and back of the green. • From the main menu screen, use toggle buttons ③ and ④ to get to the Golf Mode icon and then press button ① to enter Golf Mode. After Play Golf is activated, screen A is displayed. After satellite connection, screen B is displayed. • Once the golf club is found, screen C will be shown to proceed to the Tee Box. • Once you arrive at the Tee Box, screen D will be displayed. and distances will be shown. • From the main menu screen, use toggle buttons ③ and ④ to get to the Tracker icon and then press button ① to enter Tracker. 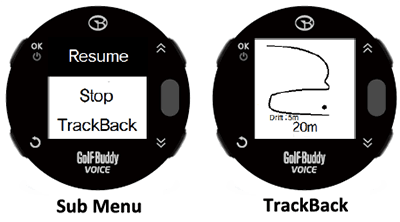 • There are 3 menus such as Tracker, Record, and Lap in the Tracker. • From the tracker menu, select “Tracker” by using the toggle buttons ③ and ④, and then press button ① to enter the Tracker. • From the Tracker mode, press button ② to go the sub menu screen. • From the tracker menu, select “Record” by using the toggle buttons ③ and ④, and then press button ① to view the record list. Press button ② to return the previous screen. • From the record list, select one record by using the toggle buttons ③ and ④, and then press button ① to view the record in detail. There are 4 sub menus such as Detail, Pace, Altitude, and Track in the record screen. When you want to return to the record list, press button ②. • From the tracker menu, select “Lap” by using the toggle buttons ③ and ④, and then press button ① to change the distance per lap. Press button ② to return the previous screen. • From the list of laps, select your preferred lap by using the toggle buttons ③ and ④, and then press button ① to confirm your selection. Press button ② to cancel your selection and return the previous screen. 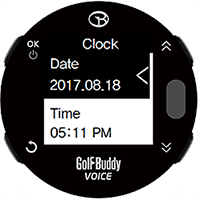 • In Golf Mode, press button ② to go to “Quick Watch Mode” where the current time, sunrise and sunset times will be displayed. The VOICEX will automatically tell you the current time. 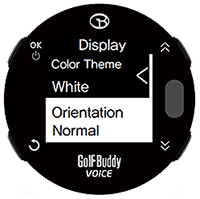 • The Quick Watch Mode will be displayed for 5 seconds and will automatically return to Golf Mode. Or, instead of waiting, press button ② and it will return to Golf Mode immediately. • From Golf Mode, press button ① to go to the full menu screen. • Select “VOLUME” by using the toggle buttons ③ and ④ and then press button ① to go to the Volume controlling screen. • Use toggle butttons ③ or ④ to control volume or set it to mute. • You can choose a gender of voice(MALE and FEMALE) by selecting"VOICE" and pressing button ①.